When you have hazel eyes, you eyes are just not one colour. Many celebrities, like Aishwarya Rai, Tyra Banks, Angelia Jollie and Kelly Clarkson, have hazel eyes. There are flecks of multiple colours in your eyes and you can play this to your advantage. By using different colours of eye shadow, you can bring these colours out. This will make you look brazen and sharp, and highlights the gold flecks in your hazel eyes. You will look fabulous on all occasions with this look. First of all apply primer on your eyelids and prepare for the makeup. To get this look, you have to let the eye-shadow extend in a sharp line. To get this, you have to use some tape along the lower lash line. Apply copper shade on your eyelid. Next you have to take the bronze shade and apply it on the crease and the brow bone. Diffuse it out using a clean fluffy brush. Now you can create a winged line using navy blue liner and then apply the mascara. Women with warm or dark skin look best in Bronze Goddess Eye look. Black and gold is an amazing combination. The gold will make the flecks in your eyes pop out and black makes a sharp contrast with the hazel eyes. First of all, you have to apply the primer on your eyelid and then follow it with a neutral shade that matches your skin tone. Now you have to apply the black eye-shadow along the lower lash line using a sticky tape. This is done to create a refined line. Next, you have to work the metallic black shade on the outer corner as well as the crease. Continue from the outer corner to the lower lash line. This will give a smokey look to your eyes. Next, pick the gold product and apply it on the centre and the rest of your eyelid. Build the product up slowly so that it does not fall out. You can pop some of this product lightly in the inner corners also. Now you can finish your makeup with false eyelashes or just mascara. The best way to make your eyes stand out is by adding bright colours to your eyes. Hot pink eye-shadow is the right one for you. Using a primer before applying the eye-shadow prevents the eye-shadow from melting into the creases. Peach smoothie, cream Brulee, MUG and Shimma Shimma Eye-shadows. Start with applying hot pink shade at the crease. Take enough time to blend it out to get the perfect look. Use little amount of the product at a time to get a diffused look. Now you can pack on a frosty shade at the centre of your eyelid and the brow bone. You can blend the colours by using a clean, fluffy brush. Now you have to dab some purple kohl on the on the outer corner of your waterline and on the centre, and then blend. Lastly, apply mascara and a purple liner to create a wing. 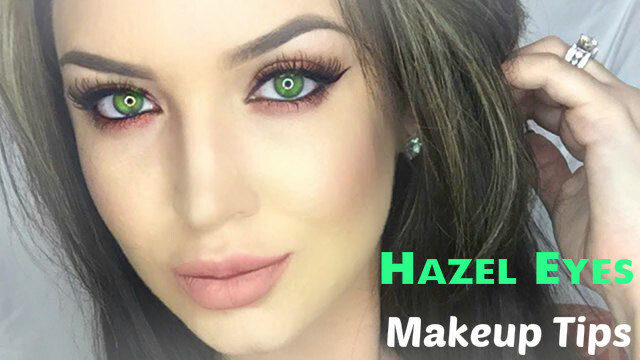 This makeup look will make your hazel eyes pop. This hot pink eye makeup look is most suitable for those who have warm skin tones. Here a combination of blue, green and purple is used. These colours make your eyes look gorgeous and help in bringing out the colour of your eyes. To crate this look, you have to start from the outside and move towards the inside. First, you have to take a subtle orange shade and apply it over the area above your crease. Now you have to apply a purple shade at the outer corners, crease and the bottom lash line. Blend the orange and purple shades with a clean brush. Next you have to line your upper and lower lash lines with metallic blue kohl. Next you have to cover your eyelid with metallic blue and blend. Take a little of green on your brush and apply it at the centre of your eyelid. Blend out the harsh lines with a clean brush. Once you are satisfied with the colours and their transitions, you can complete your makeup with some mascara. This Mermaid eye makeup look suits all skin tones. Using the colours from the opposite side of the colour wheel is an excellent way to bring out the colour of your eyes. Purple tones are great for bringing colour to your eyes. To achieve this look, you can use bright purple, aubergine, and black shades. Start your eye makeup by applying bright purple on your eye lid. Make sure that you do not extend the colour too much. After applying the dark purple, apply the aubergine shade over it and then blend it on the outside corner of your eyes and on the crease. Next you have to define the outer corner using a black eye-shadow. Take a brush that is clean, and blend well so that there are no harsh lines. You can make your hazel eyes pop by using the correct transition shades. Now you have to attach the false eyelashes. Finish your eye makeup by applying some mascara. If you have a pale skin, purple smokey eye look will suit you well.